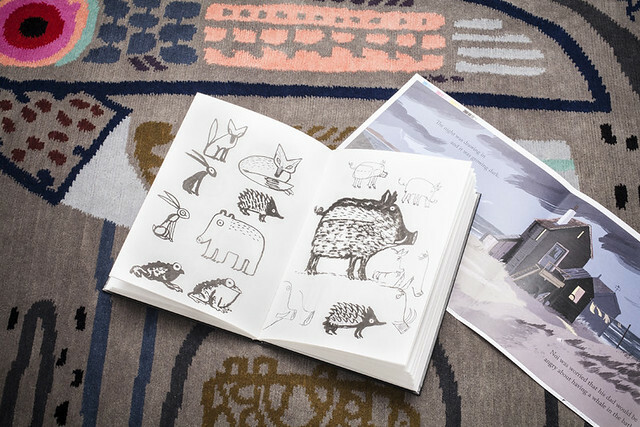 The collection brings together eighteen illustrators and designers from Europe and North America such as Lesley Barnes, Petra Börner, Jon Klassen, Micah Lidberg and Geoff McFetridge (see Eye 31), with weavers from the Kumbeshar Technical School (set up by the Khadgi family in 1983) in Nepal. The school teaches practical skills to otherwise illiterate, unskilled and disabled people considered to be in the lowest caste of Nepalese society, a group who customarily work in cleaning and waste disposal. On the basic principle of ‘trade not aid’, Node (in conjunction Kumbeshar) provide paid work for weavers and education for them and their families. The project came about after Haughton finished his first book, A Bit Lost, and travelled to Nepal and India to work with fair trade clothing network People Tree and their producer groups. 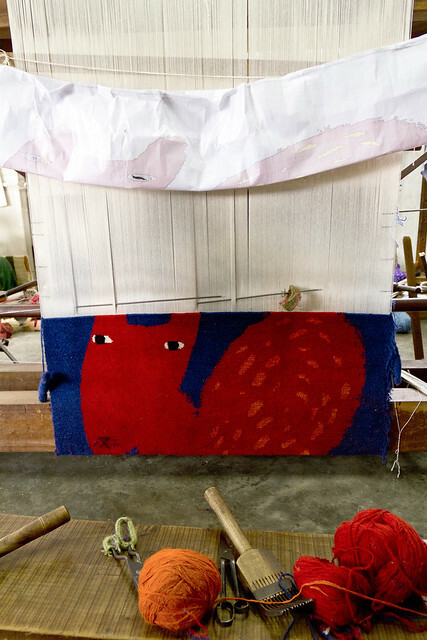 While touring a knitwear facility, Haughton spotted a small group of rug weavers and saw an opportunity to translate his illustration to another medium. Top: Serge Seidlitz pattern, back and front view. After commissioning the weavers to convert his picture book owl character to wool, it became apparent that the traditional process had an integral flaw. Among other things, his character’s eyes were distorted and no longer circular. Woven illustration by Donna Wilson on the loom. 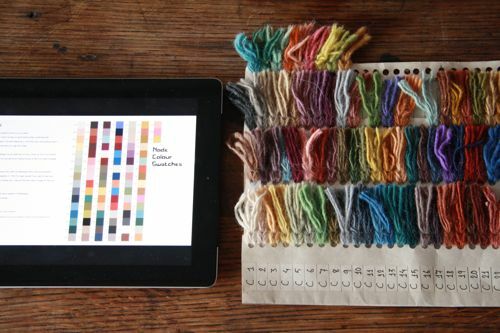 Node digital colour swatches with wool yarn colour samples. 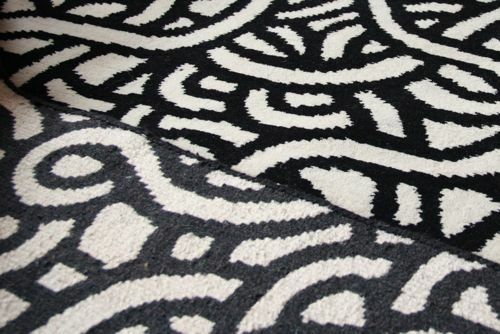 When Node was fully realised in 2010, Haughton had improved pattern making, digitised the hand-dyed wool colours and knew how to manipulate the limitations of the weaving process. 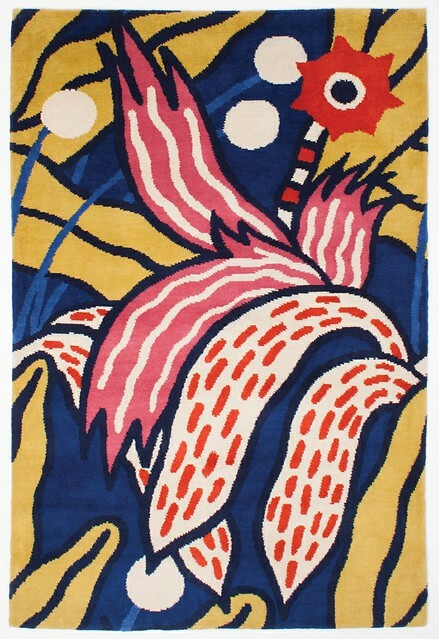 The eighteen designed rugs launching at the Design Museum are a product of those lessons with bold designs and ethical production at its core. Chris Haughton along with designers Donna Wilson, Neasden Control Centre, Petra Börner and Patternity, among others, will be presenting at PechaKucha X Fair Trade at the Design Museum, 4 March 2013 (tonight). The Node collection launches at the Design Museum shop, 5 March 2013. Finished carpet of illustration by Micah Lidberg. Read ‘Making a difference’ about Chris Haughton’s early fair trade work in Nepal on the Eye blog. Kumbeshar Technical School are a founding member of Fair Trade Nepal and are World Fair Trade Organisation accredited.